Those of you who know me by now, know that I adore anything with pumpkin spice, in fact I have a whole board on Pinterest, devoted to it. That board gets visited a lot so I figure there are lots of other folks who love pumpkin spice anything as much as me. Usually those foods revolve around dessert of some sort like cupcakes, pies, cookies, bars or even ice cream….but with pancakes I can bring my addiction to the breakfast table. These are a perfect fall breakfast and a great way to use up small amounts of pumpkin leftover from your other baking endeavors. Sprinkling the tops with cinnamon sugar and adding just a drizzle of syrup is all these need in the way of topping. I made these on a rainy Sunday morning when we could enjoy a leisurely breakfast. They were wonderful ! 1. In a medium mixing bowl, combine the flour, brown sugar, baking powder, salt and spices and stir with a whisk to combine. 2. In another bowl, mix together the milk, pumpkin, egg, and oil or butter. Add the wet ingredients to the flour mixture and whisk together just until combined. Add egg-pumpkin mixture to the dry ingredients. The batter may still have a few lumps–that’s okay. 3. Preheat the oven to 200*F. Have an oven safe platter or serving dish ready. Heat a greased griddle or skillet over medium heat. Once the griddle is hot, spoon on the pancake batter. Let cook until bubbles begin to form on the top surface. Carefully flip with a spatula and cook the second side until golden brown, a couple minutes more. Look how they puffed up! Transfer the cooked pancakes to the oven safe dish, and place in the oven to keep warm. Repeat with rest of the batter until it has all been cooked. 4. Serve warm with cinnamon sugar, maple syrup, and butter as desired. “Best pancakes I ever had!, Mmmmmm!”, says Mr. D. “Best pancakes I ever made!”, says me. No Kidding!! These are the lightest, puffiest, thickest pancakes I have ever made, they are absolutely delicious. I used vanilla non-fat Greek yogurt, but I’m sure other flavors of yogurt would be equally delicious, and give lots of opportunity to vary the flavor of these. Also you could add in other ingredients like blueberries, dried cranberries, banana, chocolate chips, etc. The recipe makes 12 – 16 pancakes, and they can be frozen and reheated in a microwave on high for 40 – 50 seconds, so they are readily at hand for weekday mornings. I really like it that they contain so much yogurt which provides 9 gm. protein in 2 pancakes yet so little fat–only what the two eggs supply. This is a power-packed start to the day. Makes enough extra to freeze. 1. In a medium bowl, combine the flour, sugar, baking powder and baking soda. In another bowl, whisk the eggs, yogurt, and water. Stir into dry ingredients just until moistened. Batter will be thick. Air bubbles start to form when the baking soda reacts with the yogurt. 2. Pour batter by 1/4 cupfuls onto a hot griddle coated with cooking spray. Sprinkle with optional ingredients if desired. Turn when bubbles form on top; cook until second side is golden brown. 3. To freeze, arrange cooled pancakes in a single layer on baking sheets. Freeze overnight or until frozen. Transfer to a resealable plastic freezer bag. 4. To use frozen pancakes: place pancakes on a microwave-safe plate; microwave on high for 40 -50 seconds or until heated through. I served these pancakes with my blueberry sauce that I wrote about here. Served with blueberry sauce. Outstanding! For everyone who is a gardner growing zucchini, you are probably starting to say “gad zukes, what will I do with it all?” If you are not inundated with zucchini now, you most likely will be very soon. So I’m going to feature some recipes that utilize zucchini in the starring role. Look for them on Thursdays, which I am designating as “Theme Thursdays”. After zucchinis, I’ll see what other food items there might be that I can do the same thing with. It’s kind of fun to see how many different ways a particular food can be incorporated into the various categories of dishes. Last summer at the farm stands near me, I saw a few yellow zucchini, and I tried one. Except for the color it is the same as the green variety. This year, I’m seeing a lot more of them. In fact my neighbor was selling some really large ones for $1.00 each. Of course, I bought several, thinking how apt they would be to feature on a blog called “Delicious on a Dollar”. Watch for them to show up in some of these posts. Today we will start with these pancakes that are moist, savory and delicious hot from the griddle; or warm, at room temperature….even cold. They can be for breakfast, or dinner, whenever you are in the mood for some non-traditional pancakes. 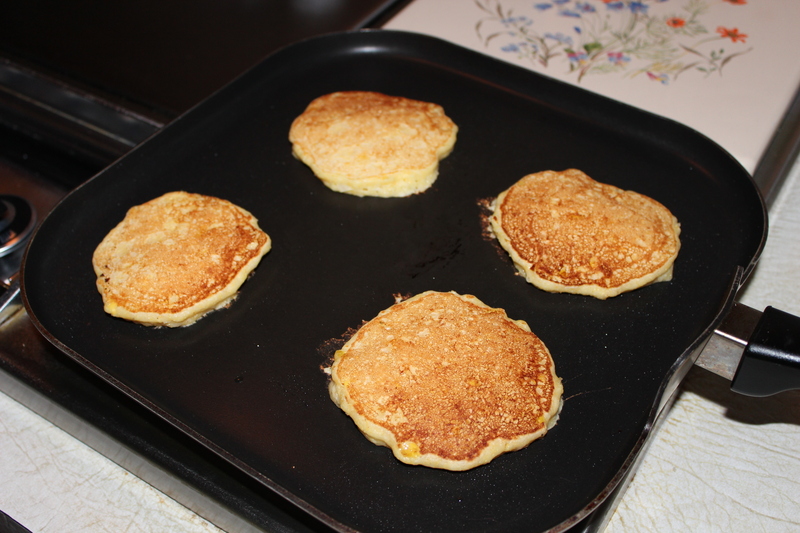 I have experimented with these pancakes and added an ear of cooked corn, cut from the cob. They were delicious served with salsa and sour cream. You can also vary the cheese used and get a somewhat different flavor. And if you don’t have scallions, try grating a sweet onion instead. Many recipes that use zucchini have you squeeze the liquid out of the zucchini, but this recipe doesn’t require that as long as you cook the batter just after it is made. If you let it sit a while the zucchini will add too much moisture and the batter will become wet. If that happens, just add some more flour to compensate. ** substitute 2 tsp. Pizza Seasoning for the dried herbs, if desired. reducing salt to 1 1 /2 tsp. 1 cup grated Parmesan, cheddar, Monterey Jack or other cheese ( or a combination). 1. Preheat a griddle or frying pan over medium-high heat; If you have an electric griddle, set the heat to 400*F.
2. Beat the eggs with the oil, salt and pepper until thoroughly combined. 3. Add the herbs, scallions, zucchini, and cheese, stirring to combine. 4. Stir in the flour. This will be a very thick batter. 5. Grease the hot griddle lightly. 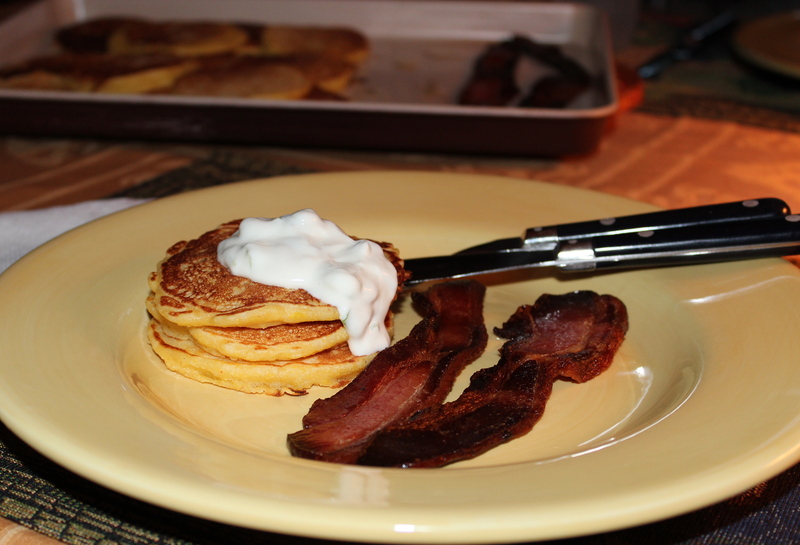 Drop the batter in 1/4 cupfuls onto the griddle; spread the batter to about 3 1/2″ to 4″ diameter. Spread batter to about 4″ rounds. Turn over when they start to get brown. 7. Flip the cakes, and cook them for about 3 – 4 minutes on the second side, or until they’re as moist/cooked as you like when you break one open. 8. Continue cooking until you have used all the batter. 9. Serve warm with butter and grated cheese, salsa and sour cream, or applesauce. Store any leftovers, tightly wrapped, in the refrigerator. Reheat in a toaster or toaster oven, if desired. Serve with butter and grated cheese. YUM! I think I was meant to live in a place where the weather is warm all year long. I just love summer; the sunshine, being outdoors, wearing summertime clothing, and especially the gardens and fresh produce to eat. That’s why I go kicking and screaming into Fall, hanging onto the last remnants of summer. One of the foods I particularly enjoy is fresh corn. Mostly we eat it on the cob either steamed or grilled and slathered with butter. As the season begins to wind down, however, I begin to cut the kernels from the cobs and freeze them so I can continue to enjoy the corn later on in other ways. 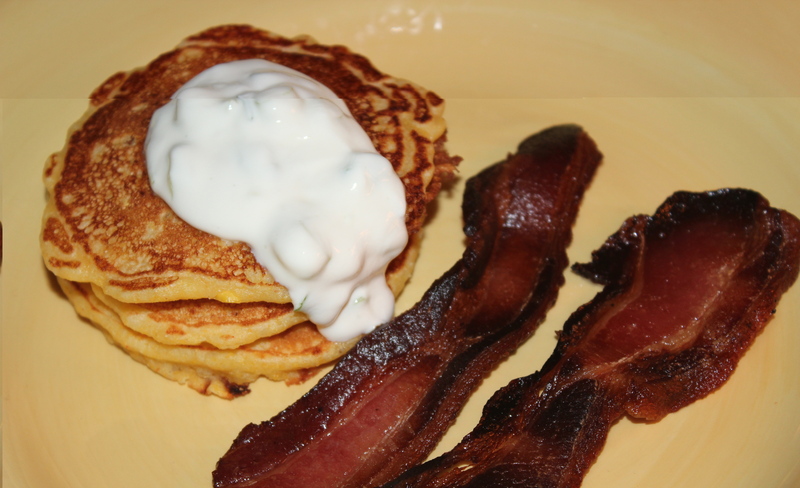 This recipe is one which uses kernels of corn in a non-traditional way: in creamy pancakes. Since the amount of corn in these is substantial, and the pancakes are quite filling, they can stand in for a meal by adding some meat such as ham or sausage. I like to make these for a Sunday night supper after a busy day outside. 1. Combine first 3 ingredients in a small bowl and chill. 2. Combine flour and next 5 ingredients – through pepper- in a medium bowl. 3. Combine 1 cup corn kernels, buttermilk, butter, and egg in a blender; process until coarsely pureed. Add pureed corn mixture to flour mixture, stirring until just combined. Fold in remaining 1/4 cup corn. 4. Pour about 2 Tablespoons batter per pancake onto a hot nonstick griddle or large skillet. Cook 3 minutes or until tops are covered with bubbles and edges look cooked. Carefully turn over; cook another 3 minutes or until bottoms are lightly browned. Keep pancakes warm in a low oven while you finish cooking all of them. Serve with the chive cream to dollop on top. Corn Pancakes Hot off the Griddle with Lemon Chive Cream.